What is an Equine Digital Pulse? 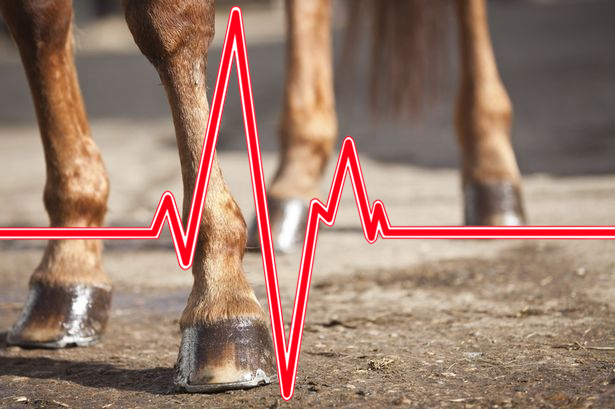 An equine digital pulse is a very useful tool for horse owners in determining if there is pain or inflammation in the hoof (or hooves) of your horse. The digital pulse is the bloodflow through the main artery going into the hooves. A digital pulse is typically hard to find/feel, this is due to the fact that there is no restriction of the blood flow into the hoof of the horse. The more restriction (inflammation) there is going into the hoof, the easier it will be to find. If you are not familiar with taking a digital pulse, you might think you are taking it incorrectly because you are feeling nothing, but in reality it is just a sign of a healthy hoof. Sometimes you will feel a faint digital pulse, and that is typically OK. We recommend taking your horse’s digital pulse regularly so you can learn what is normal for them. This will help you pinpoint red flags or warning signs of hoof discomfort in the future. If you can easily feel the digital pulse, this may also be referred to as a bounding digital pulse. This is a sign of a potential problem in the hoof (or hooves). It will feel like a throbbing headache or as if you banged your finger and it is throbbing. Not a faster pace, just a stronger one. If you feel a bounding digital pulse, be sure to check the hoof multiple times to be sure. Also check the other hooves to see if the problem is localized to that one hoof or if it is affecting the other hooves. If it is localized to one hoof, it could just be from a bruise or an abscess. It is the hoof reacting to an acute injury to that one foot. But if you ever have any concerns, be sure to reach out to your vet for advice. However if it is in multiple feet, this could spell out much more significant problems, such as laminitis (founder). Don’t immediately have a panic attack if this is the case, take in all of the other factors surrounding the situation. Did your horse just work or run? If so, the pulse might be stronger because of that. Is the horse acting normally or has their personality changed? Do they seem happy and comfortable, or are they trying to take weight off the feet? With any doubts here, always call your vet. Trust your horse and your gut. How To Take A Digital Pulse? The Artery that is used to find the digital pulse is easiest to find over the lower leg of the horse. 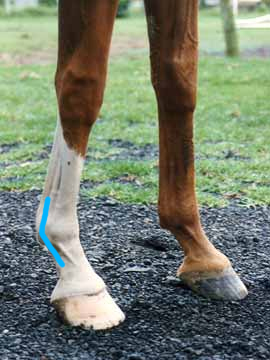 You will notice that the leg has 2 grooves towards the back, that run down into the fetlock joint. These are between the suspensory ligament and the canon bone as well as between the flexor tendons & suspensory. You will use the furthermost back groove to find the digital pulse. As this is where the artery runs. This artery runs over the fetlock and down into the foot. Allowing a few locations for you to take the digital pulse on the lower leg. If you view the image here, you can typically find a digital pulse anywhere along the blue line. You will use your 2 forefingers to feel for the pulse along this blue line. As you are learning, you may need to run your fingers around this area before you find the pulse (especially on a healthy horse), but once you are familiar with your specific horse’s anatomy, you will find where is most comfortable to you for taking the pulse regularly. And if you are ever unsure, the next time your vet is out for a routine health check or for fall or spring shots, have them show you! They love involved horse owners.